2019 Apple Festivals in Ohio - Where, When and More to Find an Apple Festival Near You! Looking for a apple festival in Ohio in 2019? (just scroll down the page)There is no other listing as complete and current as this list, just updated! All the apple festivals in Ohio we can find are listed on this page! If you love strawberries, look for a festival near you below! And I'm always looking for more apple festivals! Please write me, if you know of any to add! I update the dates as soon as the festivals publish their information, but you can always click on the links (usually the name of the festival) to see the current information on the festival's own website. Grand Rapids, OH. Historical reenactments with demonstrations and presentations of pioneer skills such as candle dipping, blacksmithing, pottery making, basket weaving, quilt making and metal spinning. Coshocton, OH. Surrounding hills, crafts, live music and apple butter simmering over an open fire at this event for over 30 years. Event dates: The Craft Show and Sale runs from 10 am to 6 p.m. Friday and Saturday and from 10 am to 5 p.m. Sunday. Enjoy live entertainment from the Main Stage 11:30 am to 6 p.m. Friday and Saturday and from 10:30 am to 5 p.m. Sunday. St. Rts. 168 & 87, Burton,. OH. - The annual celebration of Fall. Enjoy the aroma of sweet apples simmering over a wood fire in old-fashioned copper kettles, warm apple butter, fine arts and crafts show, storytellers, games and more. Visit the five fully furnished homes where pioneer crafts such as weaving, rug hooking and spinning can be enjoyed. Admission (in 2006): $5 adults, $3 children ages 6-12, seniors and children under 6 free. Hours: 10 am to 5 p.m. Call for information 440-834-1492. Country Applefest - Saturday, Saturday September 26th 2009 from 10:00 am to 7:00 pm. South Broadway Street, Lebanon, OH 45036. Phone: 513-932-5631. Email us at: [email protected]. Formerly known as Lebanon's "Applefest" PLEASE NOTE: The Country Applefest is a RAIN or SHINE event. Over 200 booths filled with food, crafts, and farmers market items. Lebanon, Ohio Comments from a visitor on September 21, 2008: "WE have gone to the festival in past years. It is fun!" Enon, OH. See apple butter being made the old fashion way in 50 gallon copper kettles, cooked over open fires. Canning and selling of the apple butter is done at the festival in the afternoon as it becomes ready. Admission to the festival grounds is free. Free parking is available. 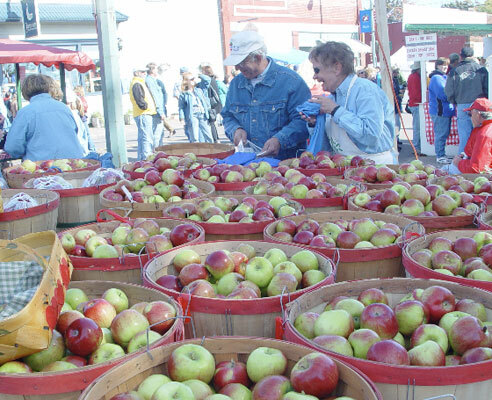 Jackson County Apple Festival - several days in late September see Schedule of events. Jackson, Ohio. Phone: 740-286-1339. The Jackson County Apple Festival has been welcoming people into Jackson from near and far for 64 years and become one of the largest and most respected festivals in Ohio. Oak Harbor Apple Festival, downtown Oak Harbor in Ottawa County. A weekend of family fun, food, entertainment, vendors, grand parade, apple dumplings and apple pies, apple treats, crafters, contests, car show on Sunday. Find it here. Free admission. Call for information 419-898-0479. Sunday, October 16, 2005 at 1:00pm. Free Admission, Free Parking, Free Wagon Rides, Free Entertainment, Free Activities, Food & Crafts, Apples, Cider, Apple Pie, Apple Dumplings, Apple Butter, Hot Caramel Corn, Hot Sandwiches, Indian Tacos, Chili, Beverages, & More. Apple Exhibits & Informational Pamphlets, Outdoor Cooking, Huge Craft Exhibit with over 90 Crafters, Antique Tractor Pull - Grandstand - Saturday - Weigh-In 8:00am - Pull 10:00am, Mile Fun Run - North Gate - Saturday - 11:00am, Children's Games - Tent at South End of Commercial Bldg (Kingsley Church), Puppet Show - Entertainment Tent - Saturday - Hourly beginning at Noon (Calvary Church), Flu Shot Clinic - Friday Evening & Saturday Morning, Child Photo IDs - Sheriff's Bldg on Fairgrounds - Saturday - 10:00am-2:00pm.